Built with up to 10000L working capacities, large-scale ribbon blenders are ideal for high volume production of powder blends, pastes, and slurries. These versatile blenders can also function as vacuum dryer and are engineered for fast mixing, convenient discharge, easy cleaning, and low maintenance. 1000L jacket type ribbon blender driven by a 15kw inverter-duty gear motor. It is equipped with a double ribbon agitator designed for center discharge through a pneumatically-operated dust-tight knife gate valve. Stuffing boxes are packed with braided Kevlar packing and include lantern rings for air purge when handling fine powders or abrasive materials. The two-piece cover features safety switches to prevent operation of the agitator when the cover is open. 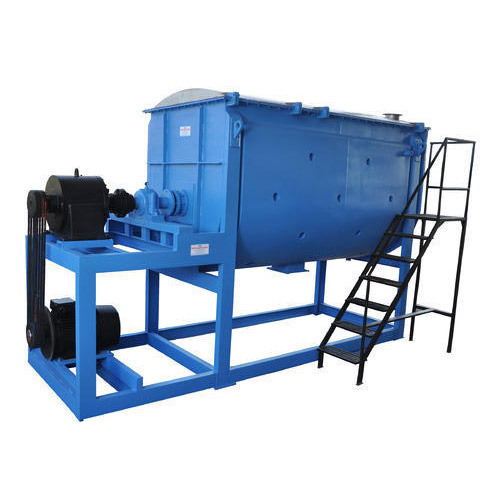 This jacket type ribbon mixer for heating or cooling the products while blending. Meanwhile, heating/cooling jacket is available for stainless steel or carbon steel. It could be customized by people’s requirement. Abster has many standard and sanitary models available. Customization such as heating/cooling paddle agitator, vacuum capability, bag dump station, load cells, and recipe control are also offered. What is the definition of ribbon mixer? An industrial-strength machine, a ribbon blender is used to mix large amounts of material in many different industries. The blender gets its name from the thin, ribbon-shaped metal mixers that perform the blending. Most ribbon blenders consist of an engine to power operation, a large trough to hold the material and a ribbon agitator that does the mixing. A ribbon blender’s agitator typically has metal ribbons, often in a double helical design, surrounding a central bar that extends the length of the trough. The ribbons are angled and balanced in such a way to continually move material within the container. eHowFood & DrinkCooking & BakingCookwareWhat Is the Definition of Ribbon Blenders? What Is the Definition of Ribbon Blenders? X William Lynch William Lynch has been a freelance writer for the past fifteen years, working for various web sites and publications. He is currently enrolled in a Master of Arts program in writing popular fiction at Seton Hill University. He hopes to one day become a mystery novelist. Share Print this article An industrial-strength machine, a ribbon blender is used to mix large amounts of material in many different industries. The blender gets its name from the thin, ribbon-shaped metal mixers that perform the blending. Add this to my Recipe Box. Quality Products to Process, Lift, Contain & Transfer Powder/Granules. Ribbon blenders are used to mix a wide range of both dry and wet materials, including such items as cake mixes, cereal, cocoa, cosmetics, flavorings, gelatin, instant formula, medications, pet food, salad dressing and seasonings. Due to the agitator’s unique design, a ribbon blender moves material inside the trough towards the discharge point, thoroughly mixing the contents without any dead spots. Ribbon blenders come in a variety of sizes and capacities, with models designed to handle anywhere from as little as five liters of material all the up to 25,000 liters or more.